Monday in Dallas, Texas. Derick Lamont Brown shot his roommate dead, shot and critically injured a firefighter who arrived at the scene, and wounded a bystander. It was the subject of LIVE news reports all that day, with regular radio programming preempted for constant updates until police eventually located the shooter, deceased from a self-inflicted gunshot. Since then, information has been sparsely reported with no apparent interest from national media. No, this crime does not fit the media narrative at all, as you’ll see. It turns out that the shooter had been under F. B. I. investigation for some time. He was the “national commander” of the New Black Panther party, and a paramilitary trainer for a black nationalist gun club in Dallas. He marched in protests against injustices purportedly committed by police, carrying a rifle. There are no marches or protests against the likes of Derick Lamont Brown, and his targeting of a first responder arriving to administer aid. Just thought you’d be interested to know why you never heard any more about the murder, and attempted murders that were the subject of such concern earlier this week. But local law enforcement, and the F. B.I. were “keeping an eye” on him, for all the good that did. It’s an illustration of a much larger situation that emerged under the Obama presidency, two of his Attorneys General and most of the mainstream media. Ever since the deception of “Hands up, don’t shoot” and the encouragement of the prior administration and the mainstream media to disrespect not only the Laws, but those who risk their lives daily to enforce them, a pattern has taken shape. Depending on whose statistics you believe, there were some 135 or more American police officers killed in the line of duty in 2016. Some, you will recall, were big national stories, like the sniper that killed five in Dallas during a Black Lives Matter protest, or the ambush in Baton Rouge that killed three police and wounded three others. There are dozens of other examples, and they’ve altered the way police go about their work. They’re no longer “pro-active” when civility breaks down, particularly in the context of some “protest” or other. Take a look at the “protest” events that have broken out on the U C Berkley campus. We’ve all seen the footage of raging fires and hooded “protesters” smashing windows and running rampant, all because some speaker might offend their tender sensibilities. Where were the police? Standing back, that’s where, apparently under orders not to intervene unless someone was getting killed. Look at the mayhem that erupted in Seattle earlier this week. What was it, Earth Day? The march for science? The election of a president who intends to restore law and order appears to have had little effect so far, because police have been ordered to stand down and let the “protesters” have their voices heard. Unfortunately, their speech consists largely of baseball bats and Molotov cocktails. Apparently, some have been arrested. But why haven’t their identities been revealed? Why are they only charged with the most minor of misdemeanors and allowed to continue their hooded rampage the next time a “protest” is organized? At Berkley, they claim to protest “fascism,” while they put that very tactic into practice through violent intimidation. The anti-fascist protesters are in fact the fascists! They conceal their identities doing the dirty work of the politically-correct left, and are not condemned by the public figures whose water they carry. Not a word from Obama, Clinton, Pelosi, Governor Brown, not a word. The President signed an executive order this week to protect “religious liberty.” This has been described as a repeal of the Johnson Amendment, which made it illegal for non-profit religious organizations to openly promote political candidates. It turns out that plenty of religious organizations are against the order, because it would mean that some organizations can now “get away with” anti-homosexual teachings, they can ignore “gender identity” issues, or refuse to participate in “health care programs” that include abortion “services.” The very idea! Many churches are offended that the government might not force the rest of us to accept their gay and lesbian priests, refugee resettlement programs, or pro-green, save the planet nonsense. Not to worry, we won’t be in the business of endorsing political candidates or participating organizationally in elections. But, since every issue of conscience and morality has been rendered “political” by government and media, there’s an absolute certainty that lines will be crossed that will offend the “political” sensibilities of somebody. Some of us can remember a time when there was no “political” component to homosexuality, and “gay-marriage” was such an outlandish concept that even the likes of Barack Obama and Hillary Clinton couldn’t imagine getting behind it. It was too sick for polite discussion, and way off everybody’s political radar. That’s all changed. Now we’ve got homosexual anchors dominating prime time on a major news network, alternatively flirting with or pouting at guests about their socialist/communist positions which, after all are “thupported” by a majority of nearly everybody, according to them and their internal polls. These are the guys (if it’s OK to call them guys) who are shaping public opinion, or at least trying to, every single day. When this obnoxious Colbert (who’s tried to romanticise his name by giving it a French pronunciation, for which there is no precedent), made his triple X-rated comments this week about President Trump and Vladimir Putin, it caused all kind of outrage. It is astonishing that any of the Big Three networks would support this kind of vulgarity, particularly when there was nothing funny about it. Surely, you’re aware of a basic rule of comedy, that it must have some element of truth, or it’s not funny. Firstly, this has to be one of the most revolting idiots ever to disgrace the air. But most of the outrage isn’t over his utter lack of respect or vulgarity, but over the claim that his remarks were “homophobic!” So his mistake was to be insensitive or insulting to homosexuals. Exactly when the ridiculous term entered the English language is unclear, but it should never have been accepted. Presumably it was invented to make “homos” (a term they embrace) the victims of people who don’t appreciate the perversion and therefore “fear” it. If they “fear” it they must also “hate” those that identify with it, and there you have it, a brand-new epithet for those who won’t go along. Homophobe! Even this word-processing program doesn’t recognize the term as legitimate, and it’s not. We’ve wondered for years whether every false concept and national sin hadn’t become so deeply ingrained in our culture that it could never be turned around. There is every indication that the most egregious of our national sins are here to stay. They’re promoted in the media, demanded by most educational institutions and are often treated as components of “faith” even by the mainstream churches. The world has become radically more dangerous in recent years. The future of Europe is anything but certain, but the French Election to play out in the next couple of days looks as though it will change nothing. Witness Iran, North Korea, ISIS all over the Middle East, terrorism in Europe and the U. S., and now the radical left and its violent demonstrations. The new administration is apparently trying to return the nation to some semblance of its foundational principles, but only within the confines of what can be accomplished in the environment of resistance by a movement that thought it had us by the throat. It may not go nearly far enough, and may not happen nearly soon enough. Have you ever wondered what lies behind the world’s, especially the western world’s, moral and cultural decline over the past few decades? What about the rise of China and relative decline of the USA, Great Britain and the western democracies so far as manufacturing, trade, the military? Can Donald Trump truly make America great again? Perhaps so, hopefully so. But what does Bible prophecy say concerning the fortunes of the United States, Great Britain and the western democracies of the world, including not just Europe, but Australia, Canada, New Zealand? The FREE book, “Europe and America in Prophecy” lays out the family history of nations, especially the family of Abraham, Isaac and Jacob, Esau and Ishmael, ancient Babylon and ancient Assyria. Where are the offspring today? And what does the Bible foretell of their national fortunes? 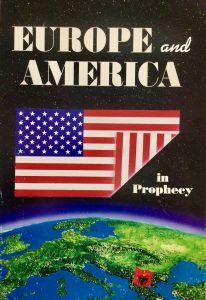 Request the FREE book “Europe and America in Prophecy“.